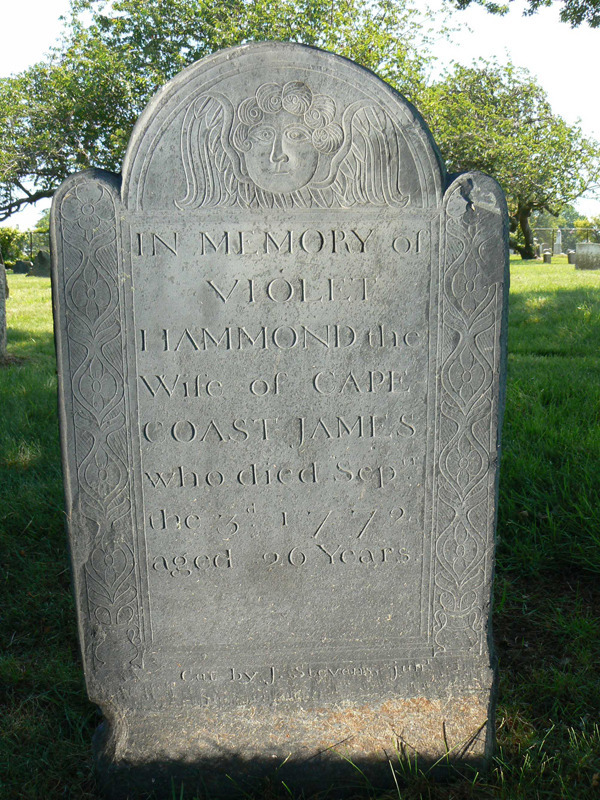 Quamino’s weather-worn marker, along with nearly 300 others, comprise a section of Newport’s Common Burial Ground known as “God’s Little Acre,” one of the oldest and largest colonial African burial grounds in the United States. Dating from the late 1600s, “God’s Little Acre” offers insight into the lives of enslaved and free Africans such as Quamino through the commemorative words and images etched into stone. Quamino’s inscription praises her “Exemplary Piety” and includes a hymnal verse: “Blessed thy slumbers in this house of clay, And bright thy rising to eternal day.” With these words, William Ellery Channing, the founder of the Unitarian Church and the author of the epitaph, recognized Quamino’s involvement in the religious community of Newport. Quamino’s husband John was also a devout Christian. After gaining his freedom, he studied alongside a minister at Princeton in preparation for missionary work in Africa, but their plans dissolved when John was killed aboard a privateer ship during the American Revolution. Like many slaves in colonial Newport, the Quaminos experienced the wave of Christian revival known as the Great Awakening during which Protestant America sought to convert the African population. In Newport, some slaves were provided religious education, converted to their master’s religion, and worshipped with the family in the home and at church. The burial ground reflects the breadth of religious diversity present in the city through carvings of angels, Biblical verses, and acknowledgements of those who lived with virtue and piousness. The markers also tell about the origins of the deceased through the traditions of names. The prevalence of Anglicized or phonetically spelled versions of names from the African Gold Coast revealed the homeland of many Newport slaves to be Ghana. Upholding the naming tradition of the Akan people, the Africans often had names that identified the day of the week and order in which they were born. The name “Quamino” is given to boys born on a Saturday. In Duchess’ case, “Quamino” was her married name after her husband. Walking through “God’s Little Acre,” the leaning, faded colonial stones are joined by the new markers of their descendants, a tribute to the resilience and preservation of African heritage in Rhode Island. Duchess Quamino: The gravestone of Duchess Quamino is now in disrepair and largely illegible, as are many of the stones in the cemetery. 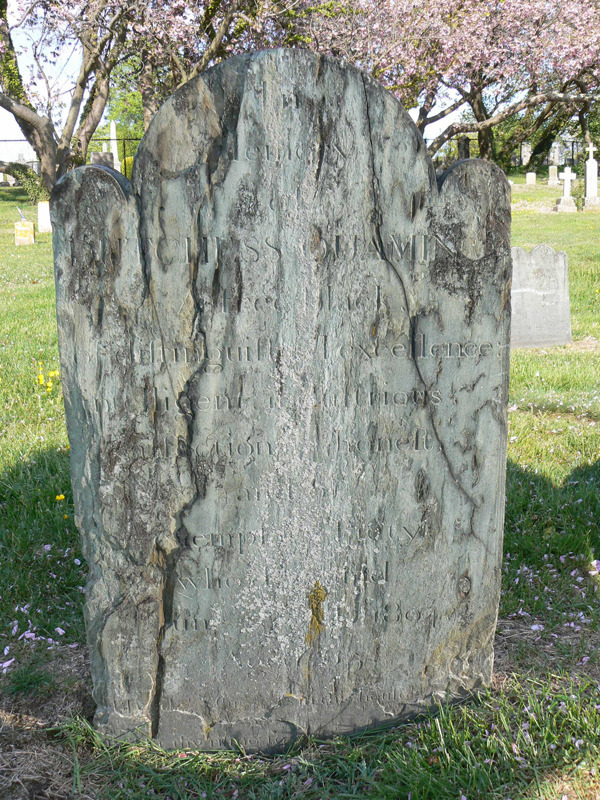 Slate, of which most gravestones before 1800 were carved, is soft and prone to delaminating. 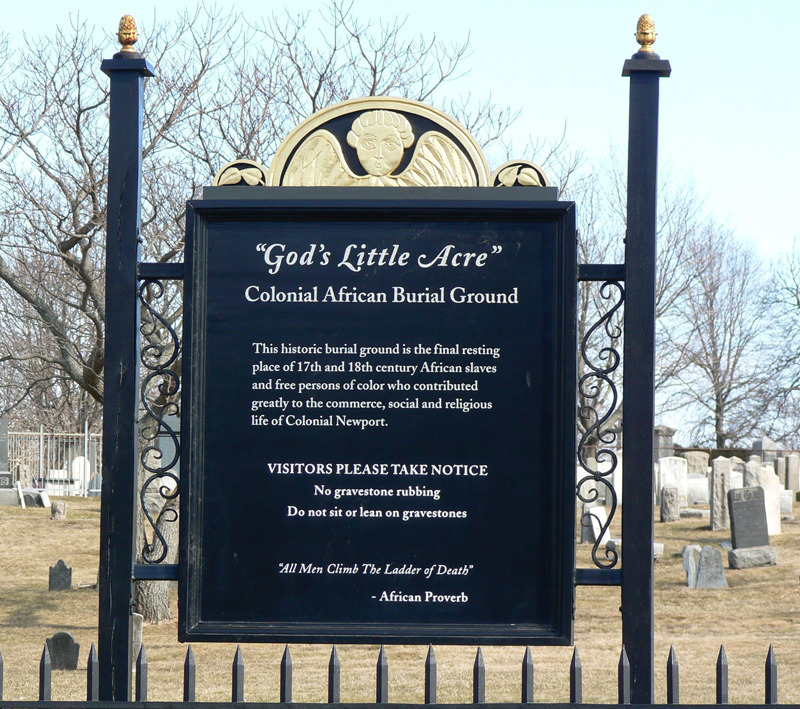 God's Little Acre: The section of Newport’s Common Burying Ground, known as “God’s Little Acre,” contains the graves of nearly 300 enslaved and free Africans and African Americans. Violet Hammond: Following African naming traditions, Violet Hammond’s marker details her husband’s origins in Ghana’s Cape Coast. 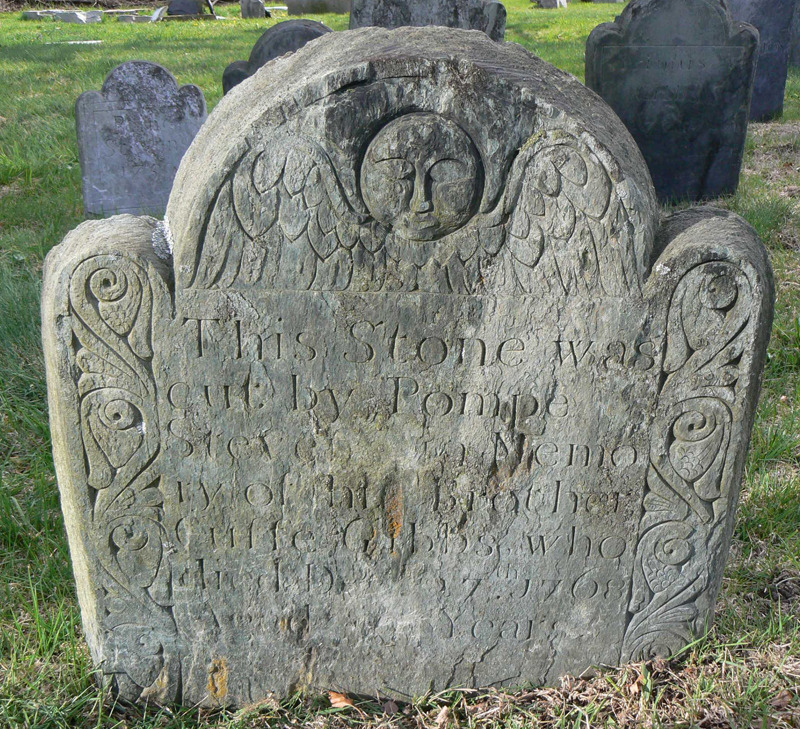 Cuffe Gibbs: This gravestone, dedicated to Zingo Stevens’ brother Cuffe, reads, “this Stone was cut by Pompe Stevens in Memory of his brother Cuffe Gibbs who died Dec. 27th 1768 aged – Years.” Stevens was known as “Pompe” while he was a slave, but reverted to his birth name, Zingo, as a free man after the Revolutionary War. This gravestone is acknowledged as the first piece of art signed by an African in the Americas. 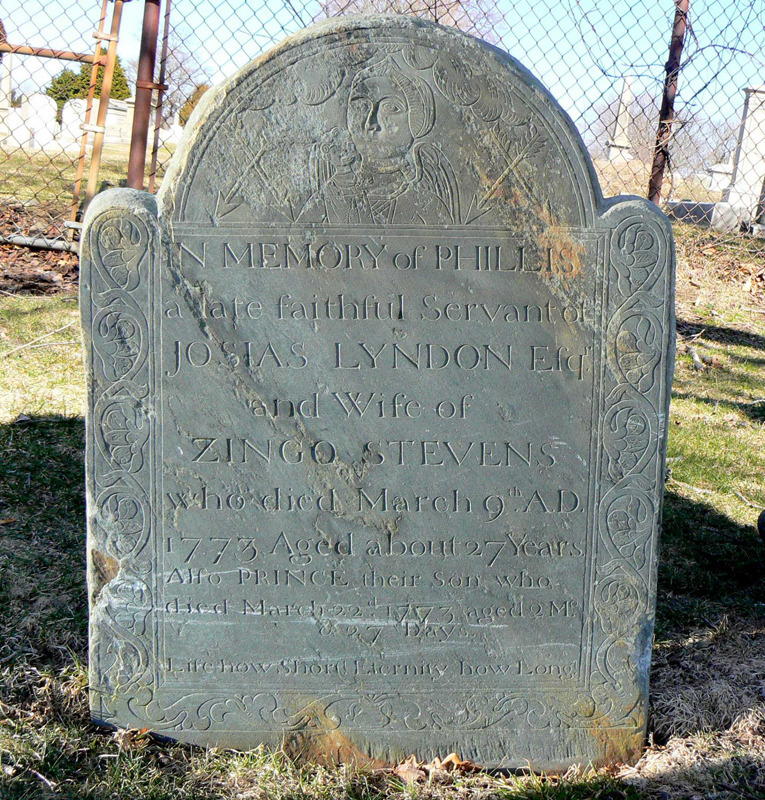 Phillis Stevens: Zingo Stevens carved an image of his wife, Phillis, in traditional African dress holding their son, Prince, after they both died during childbirth. Phyllis and Prince were buried together. Liz Gray, “God’s Little Acre,” Rhode Tour, accessed April 23, 2019, http://rhodetour.org/items/show/40. Heuman, Gad J., and James Walvin. “Slave Naming Practices in the Low Country” in The Slavery Reader. London: Routledge, 2003. Liebman, Laura. “God's Little Acre.” Reed Digital Collections. 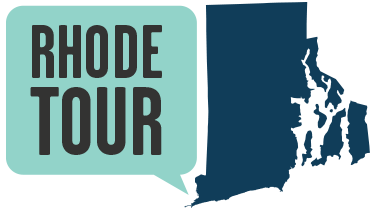 http://cdm.reed.edu/cdm4/results.php?CISOOP1=exact&CISOFIELD1=site&CISOROOT=/colhist&CISOBOX1=God's+Little+Acre%2C+Newport+RI. “Of Slavery, Psalms, and Sculpture.” Tavistock Books. http://blog.tavbooks.com/?p=74. Stokes, Theresa, and Keith Stokes. “God's Little Acre.” 1696 Heritage Group. http://www.colonialcemetery.com/.